The licensed Sesame Street C4 combo jumper will bring everyone's favorite childhood street to your party or event. Participants can hang out with their favorite characters, new and old, as they enjoy the four fun-filled activities on this combo jumper. The familiar, friendly faces of Big Bird, Elmo, Cookie Monster, Grover and others greet participants on realistic, digital artwork, with appearances by the Count, Bert and Ernie and more! 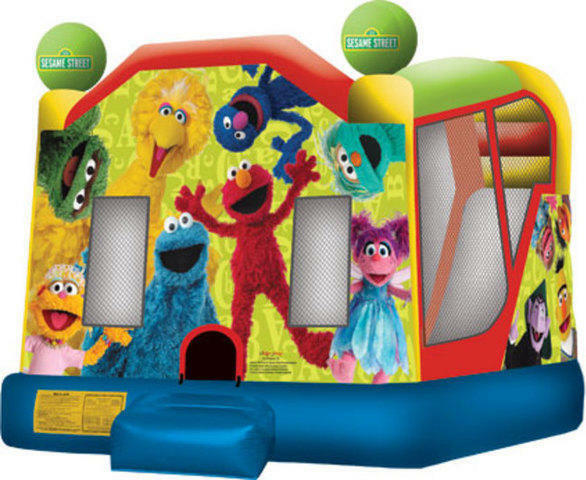 This popular line of licensed Sesame Street inflatable products includes jumps and combos sure to please kids of all ages.